Drawing on his 34 years in office, Lee H. Hamilton offers a unique perspective on Congress, foreign affairs, and the legislative process. 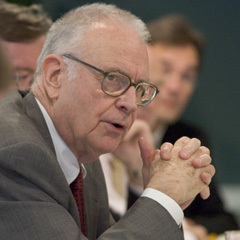 Lee H. Hamilton, former Congressman from Indiana, is president and director of the Woodrow Wilson International Center for Scholars and director of the Center on Congress at Indiana University. In collaboration with the Center on Congress at Indiana University, the Wilson Center produces a series of biweekly two-minute radio commentaries by President and Director Lee Hamilton. Longer versions of the commentaries are distributed as op-ed articles to newspapers across the country. Drawing on his 34 years in office, Mr. Hamilton offers a unique perspective on Congress, foreign affairs, and the legislative process. Five years after the Iraq War's commencement, where are we? Former Congressman Lee Hamilton assesses the situation.